Got two slices of pizza tonight. One broccoli and mushroom, and one pepperoni. When I was presented with the box, I was a little surprised. As I was walking home, I began to think about what the pizza shop gets for using advertising on their boxes…most likely, free boxes. That made me think that the pizza should cost a little less since they don’t have to pay for the boxes anymore, but then I remembered that costs get passed on to the consumer, not savings. I guess it really doesn’t matter that there is advertising on the boxes, other than it’s just another example of us being bombarded by advertising. 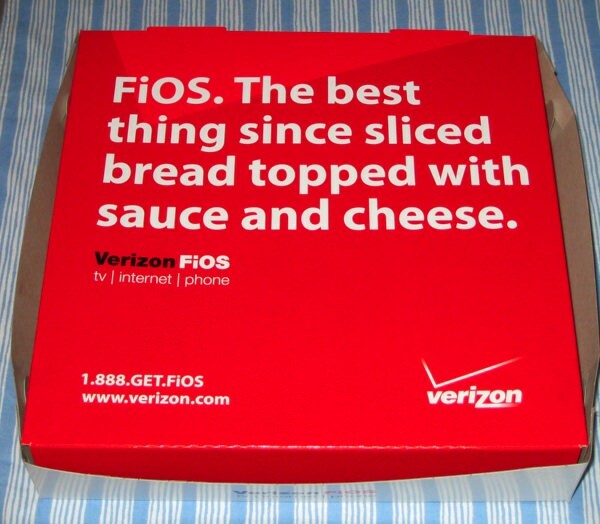 And the worst part…Verizon FiOS isn’t even available for me. Update: Looks like I might be able to get FiOS sooner than I thought.